Buttermere Lake a beautiful lake from which Buttermere village takes its name is about 1¼ miles long by about ¼ of a mile wide and 75 feet deep lying at the head of the valley of the River Cocker. Buttermere village stands at the north western end of the lake and beyond this lies the just as beautiful Crummock Water and beyond that, to the north, there is another lake called Loweswater. Crummock Water owned by the National Trust is about 2½ miles long by ¾ of a mile wide and 140 feet deep, has six small islands and is dominated by the hill of Mellbreak which runs the full length of the lake on its western side. The River Cocker flows northwards from Crummock Water into the Lorton Vale. There is a footpath around both lakes. Scale Force the highest waterfall in the Lake District has a total drop of 170 feet including a single drop of 120 feet and several smaller drops. The force, hidden in a deep gorge on the north side of Red Pike, falls into Scale Beck which feeds Crummock Water. Red Pike at 775m (2476ft) is a fell in the High Stile range separating Ennerdale from the valley of Buttermere and Crummock Water. Red Pike is a rich red colour brought about by the presence of syenite in the rock and subsoil of the fell and the paths can be seen from some distance. The ridge walk from Red Pike to Haystacks is one of the finest in the area with superb views of the Scafells, Great Gable and Pillar. From the summit of Red Pike on a clear day the lakes of Derwent Water, Buttermere, Crummock Water, Ennerdale Water and Loweswater can be seen. Bleaberry Tarn is a natural mountain tarn nestled below and between Red Pike and High Stile. The tarn which is in continual shadow from November to March is about 15ft deep and is well stocked with trout. The stream Sour Milk Gill descends from the tarn to Buttermere and the footpath that runs parallel is one of the more popular footpaths for the ascent to Red Pike. There is another Red Pike 3 miles away in Wasdale. We park at the side of the road just above Buttermere then walk downhill to the village and turn left down the side of the Bridge Hotel. We head forwards bearing to the left of the Fish Inn. At the end of the track we turn left. We come to two gated tracks and we take the one on the right with a no camping sign on it. We follow the track until we reach the stone bridge. We cross over and turn right and follow the path towards Crummock Water. We cross over two wooden bridges and keep heading forwards then bear off left following the grass path. We then bear off right to cross over a bridge then head forwards through the gate. We continue forwards to cross over another bridge then turn left following Scale Beck to the next bridge. We cross over and make our way uphill to the base of Scale Force. We turn left over the bridge and head forwards uphill to a wall. We now turn right steeply uphill with Scale Force on our right. We keep following the stream uphill taking care along the ridges and over the boulders. The path eventually turns left and we keep following it uphill. The path levels for a short way then bears slightly right along an edge towards Red Pike. We now head very steeply uphill over some rocks to the summit of Red Pike. At the top we head forwards then bear off slightly left downhill following the cairns. The downhill path is very steep on sort of crumbly loose stone here so please take care. We make our way down to Bleaberry Tarn we can see down below. At the end of the tarn we turn left following the stream. When the path splits we take the right one and head forwards. We go through a broken wall then turn right onto a track. We follow the track downhill which turns left, steep in places, until we reach a wood. We go through the gate and head steeply downhill through the trees. At the bottom we turn left then right to go over a bridge and then follow the track back to Buttermere and the car park. This is a hard walk on mostly well maintained paths and track. The ascent following Scale Beck is steep with a little climbing over boulders and up to Red Pike is quite stiff. 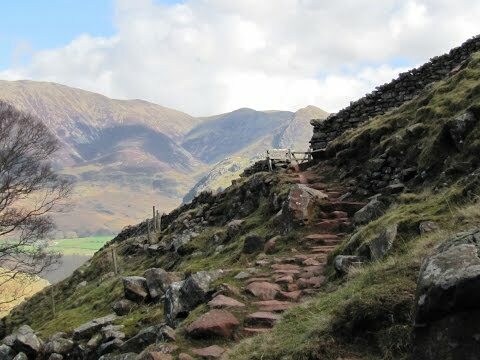 The first part of the descent down from Red Pike is very steep on loose crumbling red stone. Approx 5.5 miles allow 3 to 4 hours using OS Explorer Map OL4, The English Lakes North-western area. Start point: Free car parking area at the side of the road just on the hill above the village. Buttermere is in the Lake District, Cumbria. From the A66 take the B5292 Braithwaite. On entering Braithwaite take the first left then bear left and follow this road and the signs for Buttermere. Parking: Buttermere pay and display car park in the village at the back of the Bridge Hotel and free road side parking, just on the hill above the village. There are public toilets at Buttermere situated in the car park. For refreshments there are two cafes selling local produce and two pubs The Bridge Hotel and The Fish Inn. The next nearest public toilets, shops, cafes, take-away, pubs and restaurants are in Keswick and Cockermouth.